Bouquets of dahlias always look luxurious and are very popular. They are especially popular in the autumn. Flower shops rarely include them in your portfolio. Therefore, grower, private traders have the opportunity to earn on the vase life of Dahlia, implementing beautiful bouquets from late summer to October. 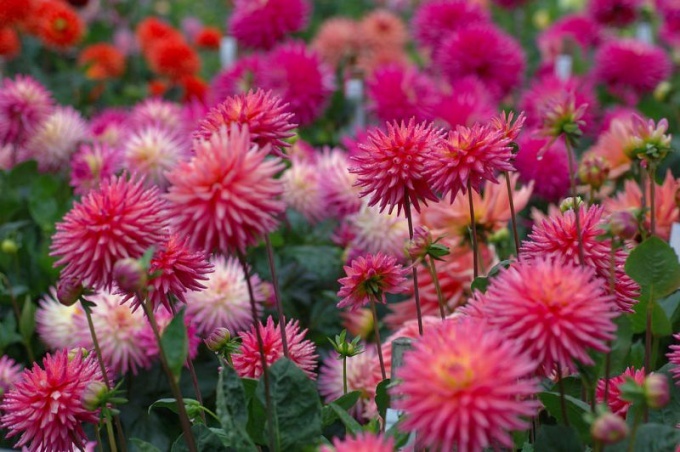 Growing dahlias for cutting, pay attention to the following important nuances. For cutting best are varieties that have attractive blossoms, looking up or in some way, having long stalks. Varieties with red, pink and white shades is the most win-win. Yellow, orange, dark, streaked much less popular. Success depends on the ability to pick for a bouquet of varieties with different color, where they beautifully complement each other. It is necessary to grow strong plants that will give quality floral stems for cutting. Issues fertilizing and watering will also be important. Dahlias are fairly drought-resistant plants. They are watered as needed in the moisture. But in the period August-September, if the weather is dry, then watering is necessary. Fertilizers are applied in accordance with the phases of the bushes. Avoid fertilizing with increased doses of nitrogen, otherwise the plants will fatten and fatten the green mass to the detriment of flower buds. One of the main components for successful cultivation of cut flowers Dahlia is systematically pasynkovat, pinch and hold pinterova bushes. And to do these activities should be the earliest time in order to route power to the flower stems. The fully opened blossoms are cut off in the evening and immediately put in water containers that stand in a cool place. All the leaves from the stems you want to remove.